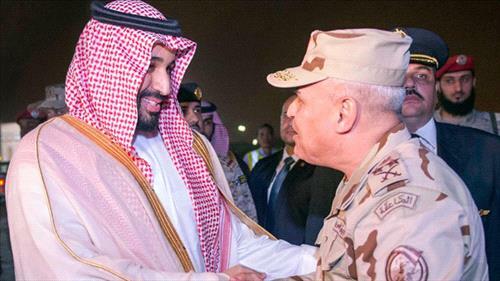 AMMONNEWS - Saudi Defense Minister Prince Mohammed bin Salman met on Friday his Egyptian counterpart Sedqi Sobhi in the capital Riyadh to discuss Egypt’s military participation in “Operation Decisive Storm” and ways to enhance the military coordination. The visit also aims to discuss ways to rid Yemen of Houthi militia and their supporters, and to restore legitimacy in Yemen. The Egyptian minister arrived in Saudi Arabia on Thursday after a three-day visit to Pakistan. Egyptian foreign minister Samih Shoukri said Cairo was willing “to send ground forces if necessary,” late last month, in a show of Egypt’s support to the Saudi-led operation against Houthis in Yemen, during an Arab League conference in Sharm al-Sheikh. The Saudi-led coalition, formed of 10 regional countries, launched its military campaign against the Iran-backed Houthi militia on March 25 at the request of Yemeni president Abdrabbu Mansour Hadi. Saudi Arabia has voiced its plan to continue the operation until it achieves its goals for Yemen to be stable and safe.